Julian Edelman, a former quarterback, had his best season ever last year, totaling a team-high 105 catches. FOXBOROUGH, Mass. – Julian Edelman had to learn to catch the ball instead of throw it when the New England Patriots drafted the Kent State quarterback. Five years later, the lessons continue. 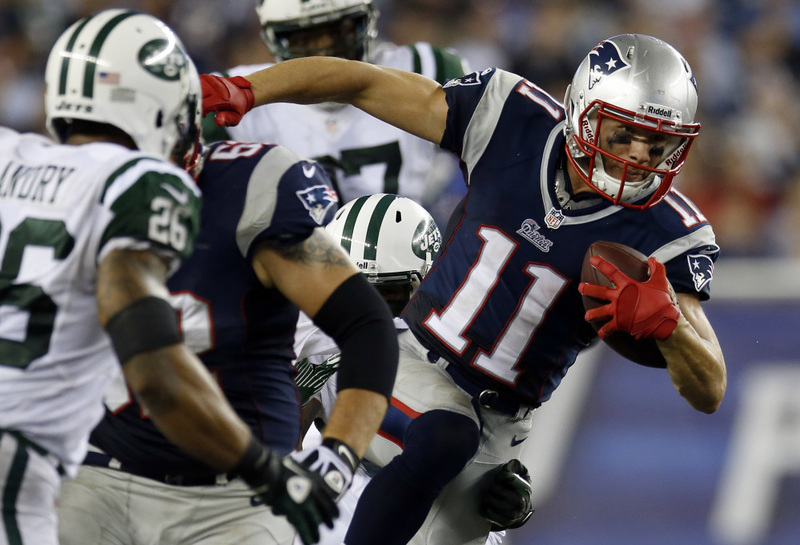 The Associated Press/Elise Amendola In this September 2013 file photo, New England Patriots wide receiver Julian Edelman (11) runs past New York Jets strong safety Dawan Landry (26) during ta game in Foxborough, Mass. Edelman surprisingly emerged as the Patriots top receiver last season. And he says he won’t change just because he signed a big contract in the offseason. Besides refining his own techniques, the Patriots’ most productive pass-catcher is getting used to a new veteran wide receiver for the second straight offseason, Brandon LaFell. A breakout season with 105 catches? A new four-year, $17 million contract? Edelman said none of that diminishes his drive to do everything correctly and not make the same mistake twice, lest coach Bill Belichick sharply call his attention to it. When the Patriots lost Wes Welker to the Denver Broncos after the 2012 season, they signed free agent Danny Amendola from the St. Louis Rams. But he caught just 54 passes with two touchdowns in an injury-plagued season. He said he’s feeling fine now and has a year of experience in the Patriots’ offensive system. “All the experience gained is the better for me going into my second year here,” Amendola said. This year the Patriots added LaFell as a free agent from Carolina. He had between 36 and 49 receptions in each of his four seasons with the Panthers and a total of 13 touchdowns. At 6-feet-2 and 210 pounds, he provides size that Edelman and Amendola lack but is still trying to decipher the playbook. The Patriots also have three wide receivers they drafted last year. Aaron Dobson and Kenbrell Thompkins had some good performances but were inconsistent, and Josh Boyce played sparingly. Dobson had 37 catches, the same as Edelman when he was a rookie, and Thompkins had 32. Edelman totaled just 32 receptions in the next three seasons with only seven in 2010 and four in 2011. But in 2013, he had at least seven catches in 10 of his 18 games, including the playoffs, and finished fourth in the NFL, earning his new contract. That was tough last Thursday during a steady rain throughout practice. But Belichick kept players outside rather than in the team’s indoor facility. Edelman was a long shot to become the Patriots’ leading receiver. The former quarterback was drafted in the seventh round. Had it not been for his skill at returning kickoffs and punts, he might have gone undrafted. But he’s not concentrating on how far he’s come, from bit player to Tom Brady’s go-to receiver.